A lucky twist on an old favorite. 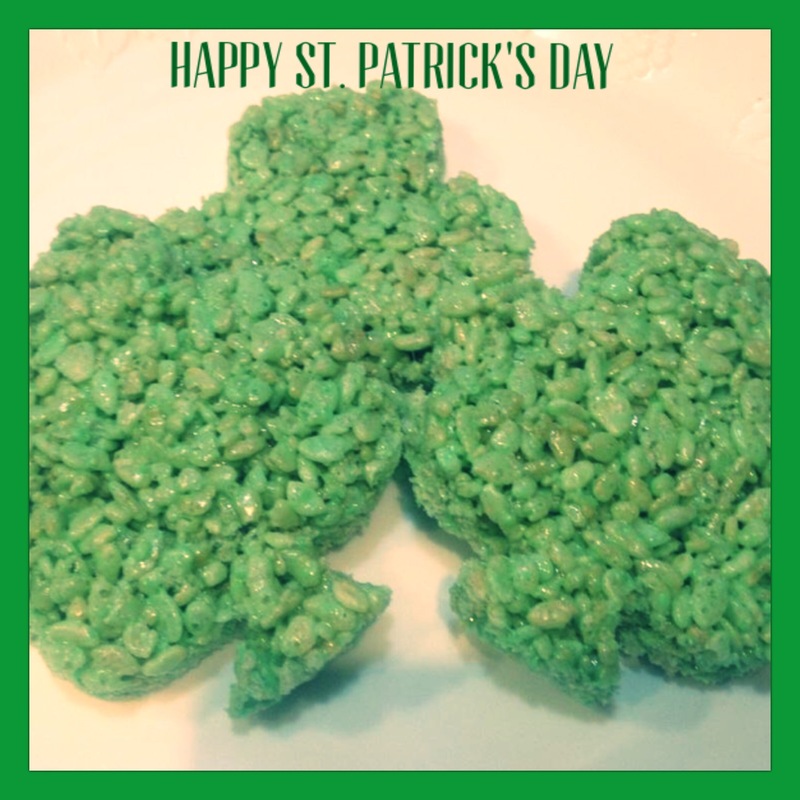 Shamrock Rice Krispie Treats for St. Patrick’s Day. Rice Krispie Treats are a timeless classic and are always a big hit with the kids. Measure out 6 cups of Rice Krispies into a big mixing bowl. Melt 3 tablespoons off butter in a sauce pan. Melt over low heat because the butter can burn if it is too high. Once the butter is melted add one 10 oz package of mini marshmallows. Stir until the marshmallows are melted and the mixture can be poured. Again be careful not to have the heat on too high or leave it on the heat too long because it can burn. Add one teaspoon vanilla, several drops of green food coloring and stir. Pour the mixture over the Rice Krispies and stir. This part can be tricky and sticky. Keep stirring until all the Rice Krispies are covered. I butter my fingers and use them to mix and shape with my hands when necessary. Place the Rice Krispies into the 13X9 pan and press down into the pan. You could use the Shamrock cookie cutter and cut right from the pan but I flipped them over onto waxed paper in order to thin them out a little. The cookie cutter I have is so big and I didn’t want them to be so thick. Once on the waxed paper cut out the Shamrock Shapes. To help cut out the shapes I also buttered the cookie cutter. I was able to cut 7 Shamrocks out of each batch of Rice Krispie Treats. Each batch will yield different amounts depending on the size of your cookie cutter. Rice Kripsie Treats are perfect for so many occasions what is your favorite? This entry was posted in Family Fun, Food & Snacks, Holidays, Recipes and tagged holiday treats, Kellogs, Marshmallow, Rice Krispies, Rice Krispies Treats, Saint Patrick's Day, shamrock, treats. Bookmark the permalink.